Joseph Fontinha's Blue Tarp Project Pop Up Installation transformed Fountain St Gallery into an interactive work space exhibition. Below he shares some reflections on the experience. 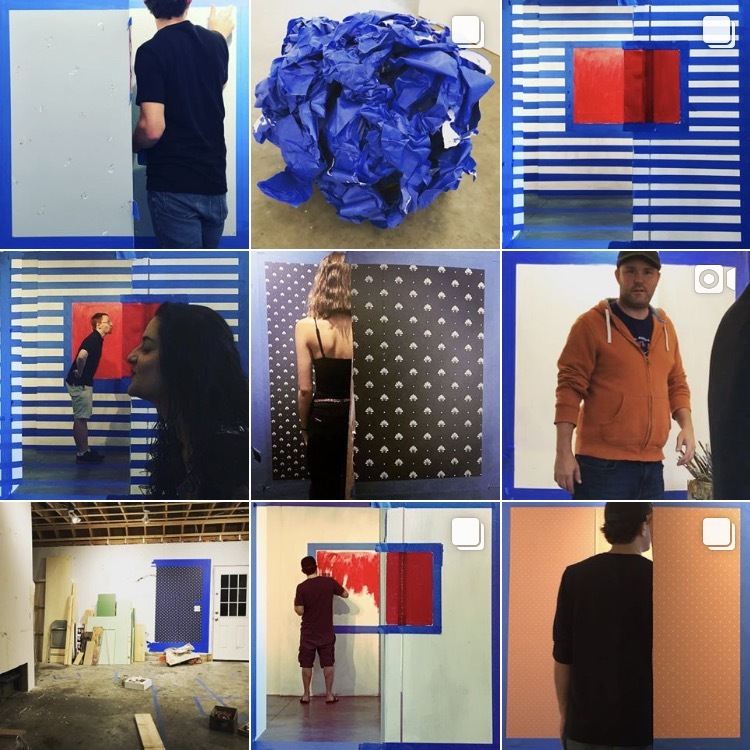 Of the three projects represented in my show: Blue Tarp, Blue Box Theater, and Fake Studio, Fake Studio was the hardest to pin down, the most ephemeral, the more illusive in terms of subject. I wanted the gallery to have in it remnants of all of my work done in the gallery over my week there (including set up.) . This was two fold, one I needed my things that I usually make with, but also I wanted to really examine the idea of curation with regards to the "behind the scenes" aspect of my studio. Often the inner workings of an artist studio is magical to others, even mythical, while for the artist, or for me specifically, it is a workspace, one that has artifacts of labor in every corner. The Fake Studio objects set up in the midst of the installations and TV's was both residual of labor but also a representation of it. Like all social media moments, what I choose to share, and this is a lot like portraiture, is heavily considered-sometimes doctored, or maybe emphasized a certain way. I wanted my exhibit to reflect this kind of thinking. I think that what I learned from the experience overall is that the work from Blue Box Theater, a grouping installations that challenge traditional space and even traditional painting-ones that have a sort of forced perspective aspect- do or did work as an exhibit. I was worried because in my studio these spaces were always a vehicle for a narrative/video/or story, acted out by myself and usually a family member. This meant sort of re-thinking the project for the gallery space, and it ultimately meant creating an interactive space which included tripods for viewers to use their phones for looking (something that mimics the way it was made or designed) and included instructions for how to use the space. When the studio was crowded, the action could be static and a lot could be happening in the cameras of the several participants. Some put themselves in the spaces for selfies, some mimicked the work I had been doing in style or pose, which I think really speaks to the power of prior knowledge and even to how things like mannerism in painting gets propagated. The project just took on a life of its own, frankly I have never sen anything like it. The component of Facebook live was a throw in, and I got great feedback from it, I think I will do that again but with more confidence and frontloading-it reminded me of Kafka's Hunger Artist, what was on display? the artist was. I think moving forward this show has really forced me to rethink what I am doing, how it is packaged, what a painting is, what kinds of submission packages I need to do in the future for calls, and even how I talk about my work. I think these "spaces" could be presented or described as paintings, they could be site specific, they could require technology or participation, etc. This has really forced me to look at how I document my work, how I share it, store it, and so on. I think written directions or specifics about how an installation will work are in my future, and certainly this show provided me with many examples that I can use moving forward. It was truly a show where work was made, a lot by me, and much by others.